Spanish for “bloody,” sangria is a bloody libation best shared around the table with friends and family by the pitcher, usually with tapas. Originally from Spain, sangria is a wine punch that quickly grew in popularity throughout Europe and was first introduced to the United States at the 1964 World’s Fair in New York. Ever since then, sangria has been a popular drink to share at many restaurants, and San Francisco knows a thing or two about their sangria. It’s easy to find a string of Latin American and Spanish tapas restaurants that serve sangria all over the city, and especially so in the Mission. We’re covering a few of our favorites here. No one dines here without buying themselves a pitcher or two of Cha Cha Cha’s famous sangria. It pairs well with their delicious tapas as Gene describes in his extensive review of the restaurant. Their sangria is infused with a variety of sliced fruit and the buzz will easily creep after just a few glasses. For a group of 4 people, you can get a nice buzz off one pitcher alone, but don’t let that stop you. Be sure to nibble on the slices of apples and oranges for a bigger punch. Although everyone seems to give Cha Cha Cha their seal of approval for best sangria in SF, I beg to differ. It can be inconsistent at times ranging from too sweet to sometimes a bit bitter. One of the best values around, a glass runs at $4, half pitcher $12 and a full pitcher for $21. Strikingly similar to Cha Cha Cha’s version, Esperpento’s sangria compliments their traditional Spanish tapas. Their sangria is infused with large dices of apples and oranges as opposed to slices. With less fruit, the sangria isn’t as sweet and the body of the wine is much fuller. A carafe is $17 and yields about 8 full glasses. You can also order a single glass for $4.50. When sunny skies are in the forecast, there’s no better place to drink up other than at B Restaurant and Bar in SoMa. This is a great place to unwind with coworkers and friends downtown after a long workday and bask in the sun with their dangerous fruity cocktails and tasty apps. If you’re not into overly sweet and fruity sangria, B Restaurant and Bar’s version is meant for you. Like traditional sangria, they add a good amount of brandy and rum to give it a some spice, with hints of cinnamon and anise. It’s served over ice with a straw so if it’s too strong for your taste, let the ice sit so it’ll water down. For $10 a carafe during happy hour (4:30-7:30pm M-F), it’ll go great with the truffle fries and $1 oysters that Gene raves about. The carafe is fairly small, yielding about 2.5 glasses total, so it’s easy for one person to finish their own, and at only $10 why wouldn’t you! One of our favorite sangria destinations in the Mission, you can drink more for less during Picaro’s happy hour. It’s light on fruit dices yet is light bodied and very sweet, making it easy to drink more than necessary (is there any other way?). It’s served ice-cold, which is nice since many places will serve sangria at room temperature or over a glass of ice. 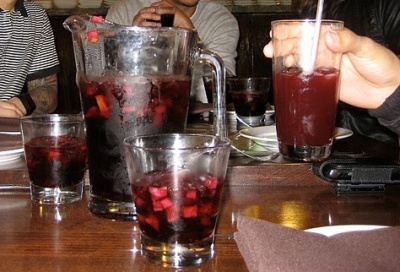 Monday through Friday from 5-7pm, a pitcher of their sangria only costs you $10 or $2.50 a glass. Otherwise, it’s $18 or $5.50, respectively. Stepping away from Latin American and Spanish cuisine, Burma Superstar and their sister restaurant B Star Bar in the Inner Richmond created their own version of sangia with an Asian twist that pairs well with their food. Instead of the typical oranges and apples that are traditionally used in sangria, the popular restaurant instead infuses lychee, asian pears and fuji apples. We ordered a pitcher on our last visit and found our first 2 glasses had barely any fruit finish. However, getting toward the bottom of the pitcher, the lychee flavor kicked in a bit more. Served over ice by the glass ($6.50), 32 oz. pitcher ($15) or a 48 oz. pitcher ($19), it’s worth a try if you want to step out of the ordinary. A nice place for (expensive) tapas, but an even better place to drink. For groups of 6 or more, order their shared group menu for $20, and for an additional $15, take advantage of their all-you-can drink sangria special. For 2 hours, the sangria will flow like water and inebriation is inevitable. Servers come by with both their white and red sangria in carafes and keep it coming when a refill is needed (which is often). Both are infused with lots of sliced fruit. Their white sangria is light in body and sweeter, tasting like grape juice or a wine cooler while their red version is heavier in body, but still goes down smoother than some of the other sangrias we’ve covered. If you can’t do a group meal, your best bet is to go on Thursday evenings when their carafes are 1/2 off. Otherwise, you can sip away for $18 a carafe. Limon Rotisserie, well known for making 7×7’s 100 Things to Try Before You Die list for the 2nd year in a row with their rotisserie chicken, not only serves great food in a relaxed and casual atmosphere, but makes some mean sangria as well. Well balanced, it captures the right amount of sweetness, tart and spice and has a flavorful fruity finish. It does lack punch, so it may take you a few glasses to feel a nice buzz, which doesn’t thrill us since a pitcher runs at a steep $25, or $5 for a glass. With plenty of chopped fruit dices, it’s often you’ll get a piece of fruit with every sip and sometimes an ice chip here and there. The list doesn’t stop here. There’s a plethora of other locations all over San Francisco that serve this refreshing concoction. Sound off on some of your favorites if we left them out. Regardless of where you end up, so long as you’re surrounded by good company, it’ll be a guaranteed good time with a lot of empty pitchers left behind. ¡Salud! Wow, great article! I love sangria, but unfortunately, where I live, there’s only crappy leftover wine from these dharma people. Anyway, I can’t wait to visit SF sometime for some sangria! YUM! Now I am having a major craving for sangria! I have had Cha Cha Cha’s – who hasn’t? But now I have so many more I feel I must try! Great Job! Great article, Aly! Just wondering if you did this all in one fail swoop or collected your sangria data over a period of time. For your liver’s sake I hope the later. Wow, I never knew there were so many different places in SF, let alone in the Mission that have so many options for Sangria. Gives me more of an excuse to go out after work and take a later bus home! Thanks for the info. In my opinion…Sangria should be served EVERYWHERE! Also, random fact…but it is surprisingly hard to get fresh sangria in Spain. Some locals told me that it is usually only served in the home for special occasions. However, Spain does have a multitude of cheap packaged “sangria” — it even comes in juicebox form. Don’t even get me started on the Kalimotxos (really cheap red wine – Don Simon anyone? – and Coca Cola) ack. Great article….still need to try a few of these! Thanks for your reply. Funny how the originator of this drink make it hard to come by in their host city. Cheers and thanks for reading!